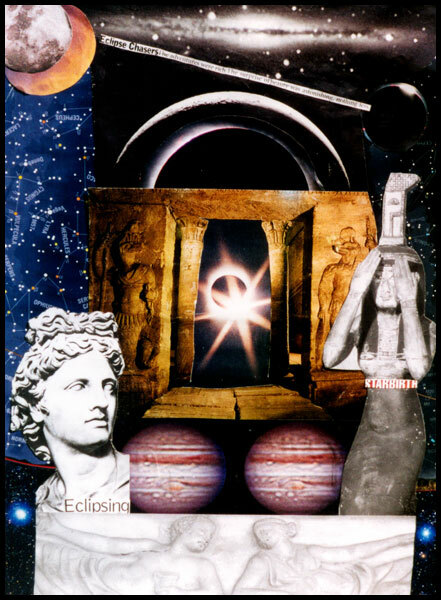 The diamond ring flashing from a total solar eclipse is enthroned between the pillars of an Egyptian temple, guarded by Anubis, the jackal-headed god of the underworld. This celestial union of the cosmic god and goddess as Sun and Moon is announced by the approach of the Moon to Sun in the upper left and reflected by the pair of lovers at the bas. Crowned by matching Jupiters, we can imagine them as Juno and Jupiter, queen and king of the gods. Emerging from the backdrop of fixed stars, the Sun god Apollo looks on from one side; he is eclipsing. On the other, Isis, with her crown, peers out from behind her hands, ready to give birth to stars, that are visible in the day sky during a solar eclipse. Is she hiding like the Sun behind the Moon, or is she shading her eyes? Above the temple, we see another solar eclipse image and the sliver of a crescent moon, like stepping stones to the Andromeda galaxy.